A common problem that happens in a chapter 13 bankruptcy case is the inability to continue to make plan payments. This inability to make the plan payment can happen for a variety of reasons. The most common reasons are job loss, illness, injury, divorce, and other catastrophic events. 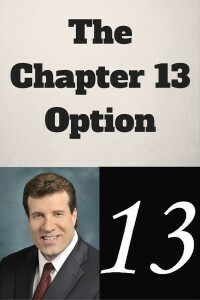 Just recently, a couple came to me with a dilemma regarding their chapter 13. The problem was that one spouse’s income was completely eliminated from the equation. This event caused their inability to not only make the chapter 13 plan payment, but to make ongoing rental payments as well. After a 30 minute consultation with all of the different parameters placed on the table, I proffered the following advice. The debtors in this particular case would be better off letting their current chapter 13 bankruptcy case dismiss. They don’t have to dismiss the case on their own Motion, rather they can wait for the trustee to bring a motion to dismiss for failure to make timely payments. This additional time before the trustee brings his motion will allow the debtors to save a little bit extra per month towards an eventual refiling. The other option would be to have the spouse get some sort of part-time employment if possible, to make up for the difference between income and expenses. Although the debtors were not happy to hear that they would be best in refiling another chapter 13, they were somewhat pleased that the monthly plan payment in a future case would be less than what they are currently paying. The reason for this is that the current case is approximately 30 months underway. By refiling, they will be allowed to restructure the existing debt over another 60 month timeframe. This will effectively reduce the amount that they are required to pay each month to the Chapter 13 trustee to be distributed to the creditors pursuant to a plan. The debtors will have to pay another filing fee of $340 at the current rate as well as provide pay advices, taxes, and other evidence of income. Further, the debtors will have to submit to a credit counseling session which must be done prior to filing the new case. to his or her office to let them know that you are having an issue. In some cases, the attorney might recommend converting to chapter 7. This was not possible in the circumstance that I describe above because the debtor had filed a Chapter 7 within the past eight years and was thus, ineligible. In some cases, your attorney may have room at the back end of the plan to defer the default. This is where the court orders that the part that you fell behind gets moved to the back of your plan. This is a great way to counter-attack a trustee’s motion to dismiss. However, it is only possible if your current plan is not running the full 60 months. For more information on chapter 13 and how you can survive a difficult time with your Chapter 13, you may contact my office directly at 847-520-8100. My exceptional attorneys and outstanding customer support staff will be happy to guide you through the process and give you the best help possible.